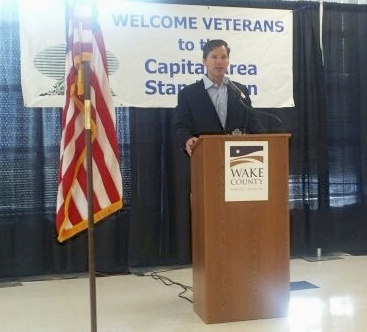 Rep. Grier Martin spoke at the 2013 Capital Area Veterans Stand Down held October 18. The event is held yearly at the South Wilmington St. Center and is aimed at helping homeless veterans get off the streets. Over 40 federal, state, local and non-profit agencies to provide information and services to homeless veterans. Martin’s legislative assistant Sylvia Hammons worked at the Stand Down for several hours, helping to link veterans with state resources. For coverage of the Stand Down see “Veteran homelessness is dropping, but jobs still hard to find” in the Raleigh News & Observer.